Microsoft announced its partnership with Spotify back in early May, and now Spotify for Windows 10 is available for download in the Windows Store. It works with PCs and tablets running the Anniversary Update or a later Windows 10 version. 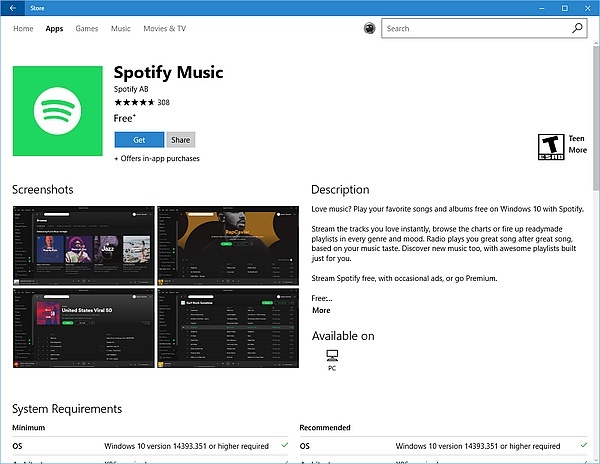 Yesterday, Microsoft announced that Spotify for Windows 10 is available for download via the Windows Store. This move comes one month after the Redmond giant announced its partnership with Spotify. According to the official blog post by Tuula Rytilä, Microsoft is "thrilled to bring the Spotify app to Windows 10 and Windows 10 S customers following on the heels of the release of Surface Laptop and Windows 10 S last week." The Spotify app for Windows 10 offers a similar experience to the Win32 application and is available in all the 60 countries where Spotify is available. Those interested can get the app and enjoy the freely available content, while a Premium subscription brings offline play capabilities and high-quality tracks. The hardware/software requirements are nothing to be worried about, since the Spotify app works on all Windows 10 PCs and tablets that run at least Windows 10 Anniversary Update.